Carboplatin is a chemotherapy drug used for treatment of many types of cancer. The U.S. Food and Drug Administration approved carboplatin for use treating patients with ovarian and non-small cell lung cancer, and oncologists often use carboplatin "off-label" for other cancers. Testicular, stomach, and bladder cancers are among those treated with carboplatin, as well as other carcinomas. Carboplatin is one of the most widely used chemotherapy medicines. Often given to a patient as part of a combination regimen of two or more drugs, carboplatin has established itself as an invaluable tool in the oncologist’s arsenal in the first against cancer. What is this chemotherapy agent? Carboplatin kills cancer cells by binding to DNA and interfering with the cell's repair mechanism, which eventually leads to cell death. It is classified as an alkylating agents. (Alkylating agents can be used for most types of cancer, but are usually considered of greatest value in treating slow-growing cancers.) Carboplatin and other platinum-based drugs chemically bond with thiol sulfurs and amino groups in the cells' nucleic acids. Carboplatin is sometimes called a second generation platinum drug. The first generation consisted of the drug cisplatin, which came to prominence in the 1970s. Carboplatin was designed and planned as an improvement – a drug that worked in largely the same way with the same chemical mechanism, but with better biochemical properties that would not produce such nasty side effects. The idea was that with a lower side-effect profile, higher dosages could be given and the direct impact to the cancer cells could be increased. 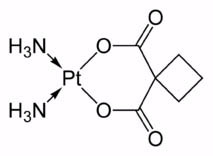 Carboplatin differs chemically from cisplatin by being a bigger molecule, with a dicarboxylate ligand. This slows the metabolic breakdown of the agent (it stays in the body longer) and reduces the rate of formation of toxic by-products. Carboplatin is often used as part of a combination chemotherapy regimen. This means other chemotherapy medicines are given to the patient at the same time (same day). There are many advantages to the multi-pronged attack on cancer. The drugs can attack the cancerous cells at different phases of the reproductive cycle. And the combination allows the oncologist to work around limiting side effects. The side effects of chemotherapy drugs are frequently what sets the maximum dose. Even if it is desirable to give more medicine to fight the cancer, the body cannot handle the increased load. These are cases where the therapeutic window is too narrow. By giving the patient a second drug which has side effects on different organ systems, the total chemotherapy dose can be increased without exceeding the maximum of any individual drug. Combination chemotherapy is so common that medical best practices incorporate them into standard regimens. Carboplatin is often combined with paclitaxel (Taxol), doxorubicin, or anthracycline agents. While a 2-drug combination is most common, there are others. A 4-drug regimen of carboplatin, paclitxel, cetuximab, and bevacizumab was recently reported to show good results against lung cancer. Carboplatin is a major tool in the oncologist's list of weapons against cancer. Health care workers, including hospital technicians and nurses, have to be careful around carboplatin and treat it as a hazardous material. In addition to being a medicine to stop cancer's growth, it is also a carcinogen – it can cause cancer, too. Another good thing about carboplatin, compared to some of the new drugs, is that it is not patented (the patent has expired) and therefore cheap. With new targeted therapy drugs going for $50K/six-week regimen and carboplatin coming in at under $2K, the cost difference is striking. This site was not prepared by medical professionals. Consult a doctor for specific questions about treatment.